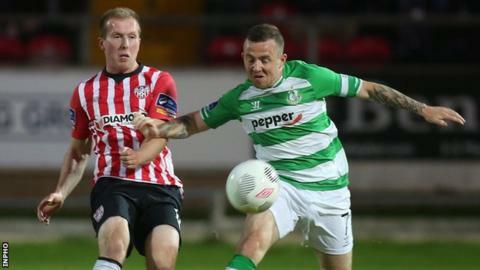 Derry City earned a vital home win over Shamrock Rovers in caretaker manager Paul Hegarty's first game in charge following Peter Hutton's departure. Dean Jarvis directed a backpost header into the net in the 74th minute to move the Candystripes six points clear of the automatic relegation position. The Candystripes had gone eight league games without a win against Rovers. For Derry, it was just their seventh Premier Division win of the season, and only their third at the Brandywell. The hosts are four points clear of the relegation play-off spot. The first chance of the match fell to Derry's Ciaran O'Connor but Barry Murphy produced a fine save from his shot through a crowd of bodies. Ger Doherty made a crucial block from a Brandon Miele effort, while O'Connor forced Murphy into another fine stop before the interval. After the break, Mark Timlin saw his shot deflected over the bar, then Doherty denied Rovers substitute Damien Duff. Jarvis's header proved decisive to give his side a major boost in their battle to avoid the drop.